Just added some more Keshi to the collection. Check out last post for pics. So wait a second, are these more like Monster in my Pockets from the 90's, I thought they were erasers! I never knew there was a collection like this too. Very Interesting! I'm no expert so all I can say is that this collection looks really good June. =) It Reminds me of the little similar yellow, pink, green colored styled He-man erasers that we used to get in my area back in the school days. Then came the similar styled rubber material like Dinosaurs that grew overnight or something like that once placed in water and that was something really cool for me, the only thing I had wished for that time was it should have had the glow in the dark Radium feature. Was anything like that released for the DB/Z/GT/S line? I remember having the eraser figures like he man. But what I have is keshi figures, like Muscle & monsters in my pocket. Not to be confused with keshigomu which means erasers. 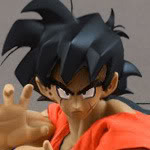 And I wish they had they made the grow in water DBZ :0 that would've been rad! Awesome collection of Keshi. I have tons of them too. Love them so much. So many obscure figures made in that line. I found a list on DBZ Wiki. Not sure if it's absolutely complete, but a great way to get the Keshi into sets. Lots of pics too. Haha yeah would have been super cool to have those grow in water dbz style figures. Yes I did read about Keshi collection meaning before posting here in the link that the ever helpful drowningrabbit posted in another thread. Thanks Mr. =) Although I like to ask the collectors themselves about their collection and everything related to it or at least as much as possible. I think it's more fun that way than to get all the information from Google and come here drop a like and vanish like Batman. I have to ask this curious question, have you ever felt the temptation of maybe just maybe painting one of these Keshi figure to the anime style? Does not have to be some permanent color it could be poster colors too. Hurray! Someone else who collects keshi. Nice collection you have going. Most of the figures you have are from the DragonBall/Dragonball Z Keshi Gashapon series. The orange Oolong bat and Puar bat were included with instant ramen. The green Gohan with the black armor is from DragonBall Z Cross-Up (Kurosuappu/Kurosu) Part 7. The Orange Trunks with blue armor is from Cross-Up Part 7 or 8. The purple Tien looks like it is from a Cross-Up series, too. Possibly Part 5. Figures in the Cross-Up Series had clothes/armor that would clip on over the figure. The red Frieza form 1 and Frieza with the "red thingy" on his back are both from DragonBall Z Part 11. The figures came with a scouter lens you would place over the plastic insert on the back to reveal the power level on the sticker. The light yellow-ish Krillin with hair is from a series of Shokugan (candy toy) called Plate Base. @craker I haven't been on in awhile so I'm just seeing your post. Thank you so much for the info, it really helps to sort them out. I recently got another lot of Dragon ball Keshi and will be posting soon. Collecting these are so much work lol will have to start logging them into sets for completion. (Completing being nearly impossible I know lol). Thanks & all help for ID's is greatly appreciated in advance. You got some really unusual characters! Who is the top left blue one? I don't recognize him at all. The 3rd one looks like a DB movie villain. I don't recognize the top left peach colored character either. The Dodoria without armor is funny!